The residents of the old town remained and nursed their disappointment as long as they could, and finally yielded to the pressure, and several of them transported their houses, small one-story buildings, to the rival town. … Mr. Asa Eastman, of Springfield, … bought out the claims (in the old town) from the various lot owners, petitioned the State Legislature for a vacation of the town, and Mr. Eastman sold the land to Madison Curvey; it was converted into a cornfield, and thus fades old Auburn, as a town, from the public view. It probably was only minor compensation that the Illinois General Assembly later rejected Wineman’s preferred name for the new community — “Wineman” — and voted to retain the name of Auburn. Coal mining, with four mines employing as many as 800 miners, was the underpinning of Auburn’s economy from the 1880s until the last mine — the Panther Creek/Union Fuel Co. mine — was shuttered in 1924. A fire in March 1910 devastated the east side of the Auburn square, destroying more than a dozen buildings. Included was the Commercial Hotel, owned by the Reihl family. A daughter, Marie Reihl, recalled the fire, but also good times in early 19th-century Auburn, in the History. 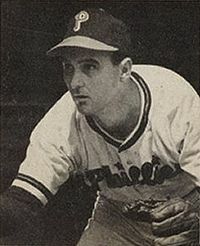 *Emil “Dutch” Leonard (1909-1983): Major league baseball player from 1933 to 1953; born in Auburn. *Hugh S. Magill Jr. (1868-1958): Educator, lay religious leader and Illinois state senator. He sponsored the law that gave Illinois women the right to vote in 1913. Born on a farm outside Auburn. *Roswell Magill (1895-1963). The son of Hugh Magill, Roswell Magill was an eminent law professor and income tax expert who served as undersecretary of the U.S. Treasury in 1937-38. In that role, he made the cover of Time magazine’s Jan. 31, 1938 issue. Born in Auburn. More information: The History of Auburn (Auburn Historical Society, 1965), linked above, is a flowery, but valuable, resource. Today: Auburn’s population in 2010 was 4,771. The city is 18 miles south of Springfield on Illinois 4. This entry was posted in Coal mines and mining, Communities, Disasters, Prominent figures, Sports and recreation and tagged Fires. Bookmark the permalink.